Ever since The Da Vinci Code was published, the already large amount of material on or by Leonardo da Vinci seems to have exploded. Hidden in plain sight in all his notebooks filled with sketches and ideas are his FABLES! 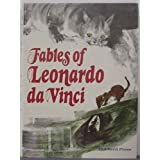 Even as I work on this, my husband commented, "I didn't know da Vinci wrote fables!" Bibliomaniac that I am, I came across one of these translations and knew they deserve a place here. The interpretation and transcription by Bruno Nardini opens with the fable of "The Paper and the Ink." Here's my own brief retelling of da Vinci's fable. The paper was outraged, "How dare you write all over me! Look at what a mess you made of me!" "Calm down," said the pen. "I merely put words on you, turning you from a blank sheet of paper into a message. Now you hold the thoughts of a person, making you important because you save those thoughts." Not long after, someone tidied up the room with the desk, burning the many sheets of paper. Just as it was about to be thrown in the fire, the paper with the words, however, was kept because its message might be important. Words! How important they are to storytellers and thinkers and our audience. Facebook has a page announcing the book, Tales of Leonardo Da Vinci mentioning all manner of illustration, but not the writing. I love, however, where it says "Improve your brain with the tales of Leonardo Da Vinci! His fables convey evergreen, eternal truths, infect the modern reader and extend a better understanding of human relationships and society." Youthwork Practice looks at the cautionary fable of "The Hungry Fox." The Charles Haddon Spurgeon article there applies it to 1 Peter 5:8, but most of the questions could easily be applied to judging the safety of a situation or people.
. . . after a look at the old boy's humor, I think it would make him smile.